Jumpin’ the Rails is set in present day and the Civil War. The book’s main character lives in the Griggs House — a home on the Alabama Register of Landmarks & Heritage. This 1858 Greek Revival was built with quarried Alabama and Florida limestone that was transported to West Point by rail. On April 16, 1865, its 18-inch walls shielded Wilson’s troops from the Confederate cannons firing upon them from the earthen fort above the house. The War wasn’t in a distant land, it was in America’s backyard and it came to the Griggs’ House. At the end of the one-day Battle of West Point, the wounded and dying from both sides of the fight were cared for in its rooms and hallways. Since the War, the home has undergone renovations but damage from the Battle remains to this day. Those cannon scars are preserved in the sunroom wall. It is the one wall that most visitors ask to view but can be easily missed. This year our Country marked the 150th Anniversary of the War’s end and most importantly the end of slavery. Why is it important to commemorate the War Between the States? Former Alabama Chief Justice Perry O. Hooper, Sr. often cited in his speeches that to forget our history puts us at risk of repeating it. Look at Lincoln, one of our Nation’s most beloved former Presidents, he gave his life to restore and preserve the vision of our Founding Fathers. He also had an interesting perspective on the War. He believed that the lives lost on both sides of the conflict were necessary to heal our Country, that neither side was blameless. In reading Jumpin’ the Rails, you’ll find that one of the adventures takes you to the 1860s Griggs House. Things were much different in the past! How does first-hand knowledge about the War and the 1860s affect the characters’ understanding of their present-day opportunities and freedoms? 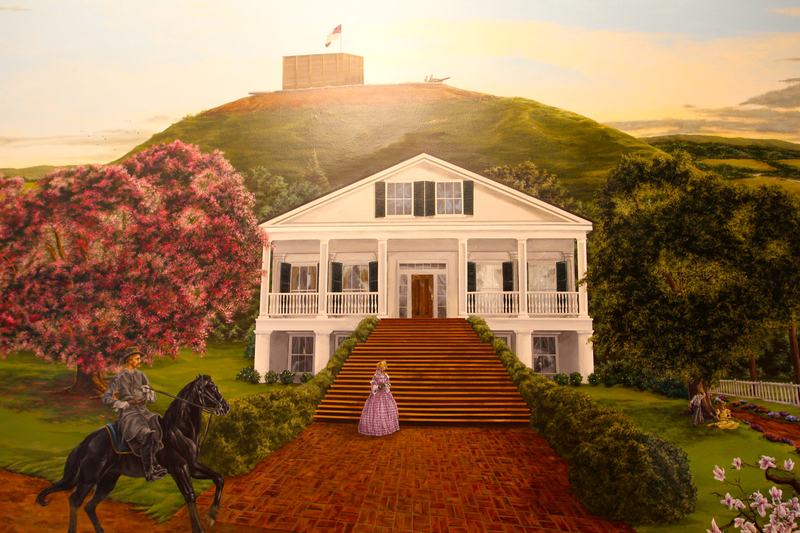 The Morning of the Battle, a mural in The Griggs House, is the cover for Georgia’s Guide to the Civil War (The Final Campaigns & Audio Tour.) The mural depicts Easter morning before the Battle of West Point, April 16, 1865. It was painted by the book’s cover artist, Connie Wilkerson-Arp. For more information about the artist visit her website at http://www.crookedcrowstudio.com/home.html. I am one the luckiest to visit this fabulous Mansion with Dr. Swaroop. We were delighted to have you. Previous Previous post: Go Ahead, Judge This Book by its Cover! Next Next post: I Had the Last Word!